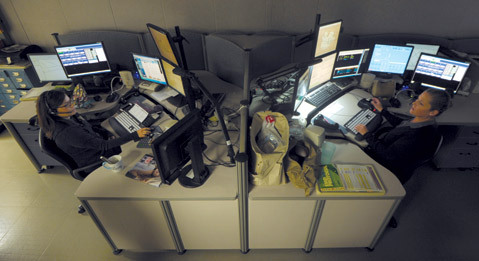 <b>SEISMIC DANGER:</b> In case of an earthquake, police dispatchers — now buried in the basement of the seismically substandard police station — might survive, but they’d never be able to go back in. Harwood added that the center currently serves as a statewide communication hub and suggested that its loss would have consequences beyond the local orbit. Because the new location is not as seismically sound as a new hospital or school, it cannot be deemed a permanent replacement. But as a practical matter, it will remain a perpetually “temporary” solution, at least until the funding is found to build a new police station. Although most councilmembers regard that as a high priority, the cost is exceptionally high, and there’s little hope of funding for the foreseeable future. Building the new center should not be tricky, but relocating the communication equipment without a break in service is much dicier, described in the staff report as “delicate and complex.” For that reason, the city hired a vendor specializing in such tasks.